You must be root of course! P.S. 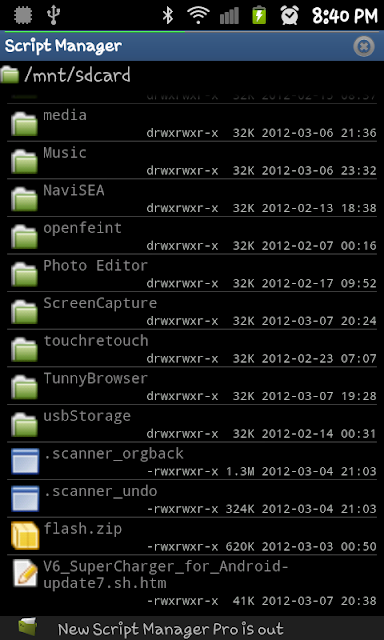 When Installing Programs, MAKE SURE Script Manager are installed on PHONE and NOT in the MicroSD Card! After installing, run the app. Put it in the root of MicroSD card. 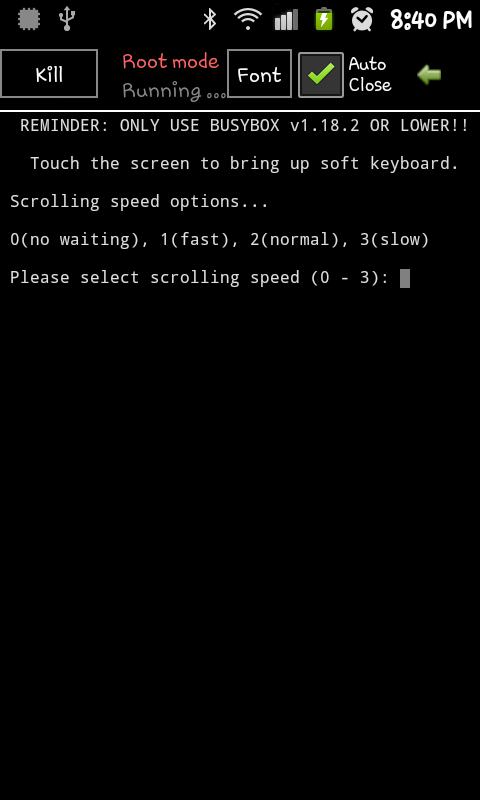 Now, Click Run on the top left of the screen to run the script! It should look like the picture below after you click Run. -Touch the screen and tap the number 6, Balanced 3, the best choice , and hit ENTER .... The script will work .... after finished, touch the screen again and tap the number 17 (maybe different for some phone), to exit, and press the HOME button. 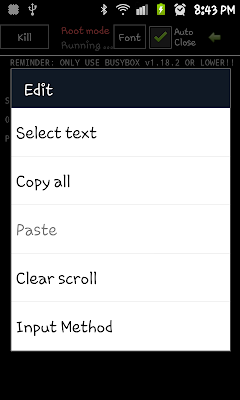 If there is no soft keyboard appear after you touch the screen when running the script at the Last Step, please Long tap anywhere at the screen and choose Input Method and select input method that working for you. I use Swipe. NOW, YOUR PHONE HAS BEEN SETUP SUPERCHARGER, BUT NOT AUTO START IF YOU REBOOT PHONE. OK DO THIS TO MAKE SURE SUPERCHARGER AUTO START EVERY TIME YOU BOOT YOUR PHONE. 3. OPEN DATA FOLDER, AND FIND 99SUPERCHARGER.SH FILE. CLICK ON IT TO OPEN IT. 4. TICK 'SU' AND 'BOOT' , SAVE OR RUN. TO CHECK SUPERCHARGER RUNNING OR NOT. U WILL SEE supercharger ALREADY applied! v6 supercharger script is the ONLY Complete Memory Management Fix. After install v6: No more lag! No more launcher redraws! Smooth. a screenshot would also help me find the answer for your question..
Im so sorry, it was my fault that i install busybox v1.19.2 if not mistaken. that's why, my problem was solved after i reinstall the correct version. Thanks a lot for your help Hunter! so in /data folder i can`t find 99SUPERCHARGER.SH and what to do? you sure you installed it already? if u installed it already, there should be a 99SUPERCHARGER.SH file in the data folder. i did all the instructions. try to check whter SUPERCHARGER RUNNING OR NOT. 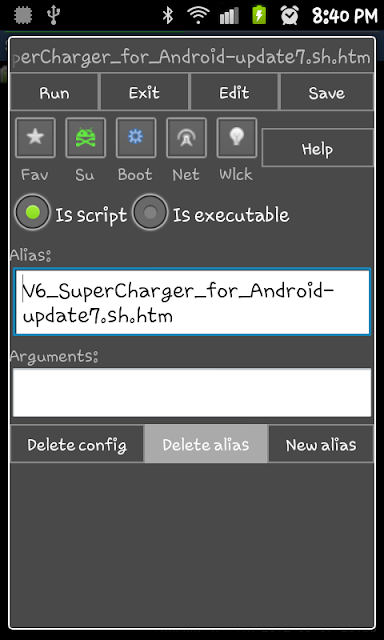 can i uninstall SCRIPT MANAGER after i supercharge my device ?! Will my phone be unsupercharged when a install a new rom ? Can you explain to me what is super charger? The Supercharger V6 Script is a complete memory management fix. It promises to solve lag and launcher redraw problems on devices. NO LAUNCHER REDRAWS, faster than ever, multitasking is better. i want to try this but its look like so complicated? hmm..
Is this mean supercharger running success? So, I just installed the supercharger script and got everything setup and it was running... Supercharged at 50% because I haven't patched the .jar file. After I reboot my phone (Samsung Infuse 4G) I'm stuck on the CM boot loader... 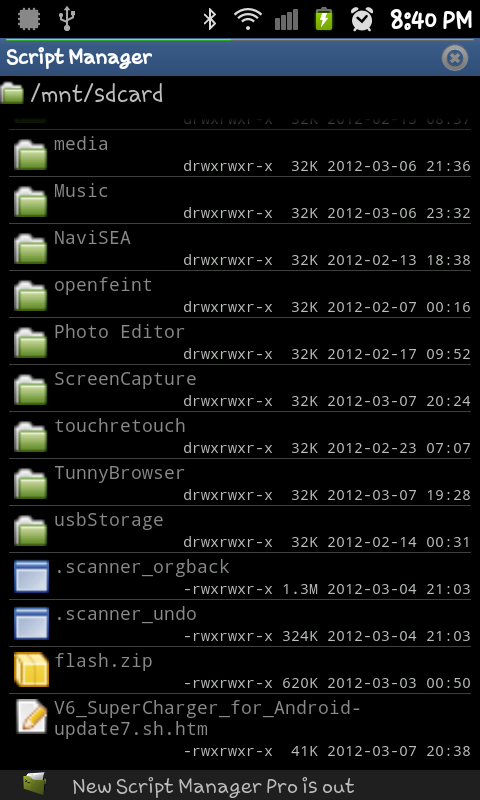 I'm currently running CM10 (Unofficial)... Any ideas? Tabs on top [onboot] and [99Supercharger.sh] - this one is highlighted in blue. When i select [onboot] i get the menu to run script ... select 0-3 etc. I assume something is not right because i don't get "Supercharger already applied"
running Xquizit rom 6.1 samsung exhibit 4g. Can we also uninstall Busybox Installer? Hi there, i tried once, but what i get after reboot, it is so slow , lag evrywhere, make me flash back my rom.i dont know why it goes like that. Now im afraid to try again. STUCK IN CHOOSING SCROLLING SPEED , HOW CAN I SELECT ? v6 supercharger? 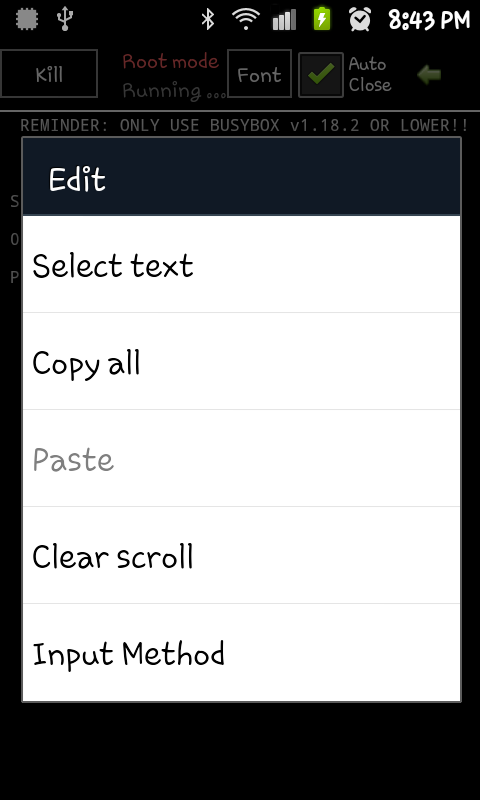 It did not work on my galaxy W running 4.2.2 Cyanogenmod. Started lagging like hell and force closing and hanging and all those stuff. But I already have a backup, so no problem! !